The Tata Nexon Aero edition comes with a host of customization options for this sub-compact SUV. The pack includes up to five different levels of customization. The basic kit starts at a price of INR 30,160. The Tata Nexon is one of the best looking sub-compact SUV currently on sale in India. With its radical design layout, it has started to appeal to quite a lot of young buyers in India. To further increase its popularity with the customers, Tata Motors has introduced the Aero packages for this vehicle. These customization packages are available in a total of five different configurations. 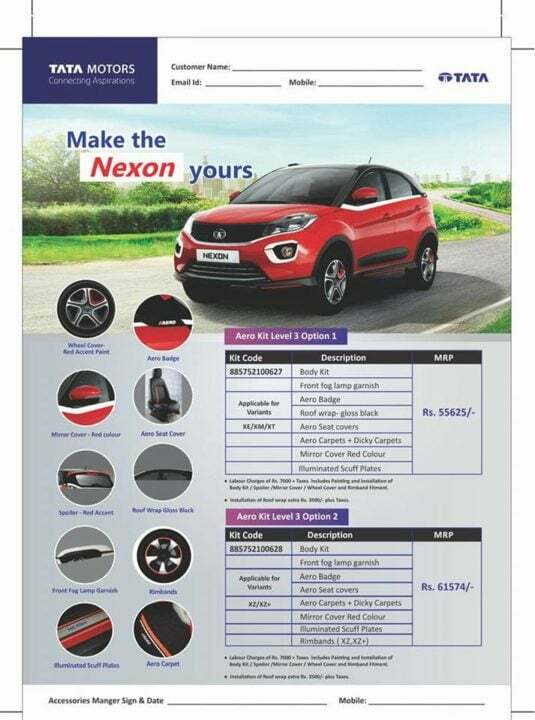 The most basic one can be fitted to your Nexon at a price of INR 30,160. 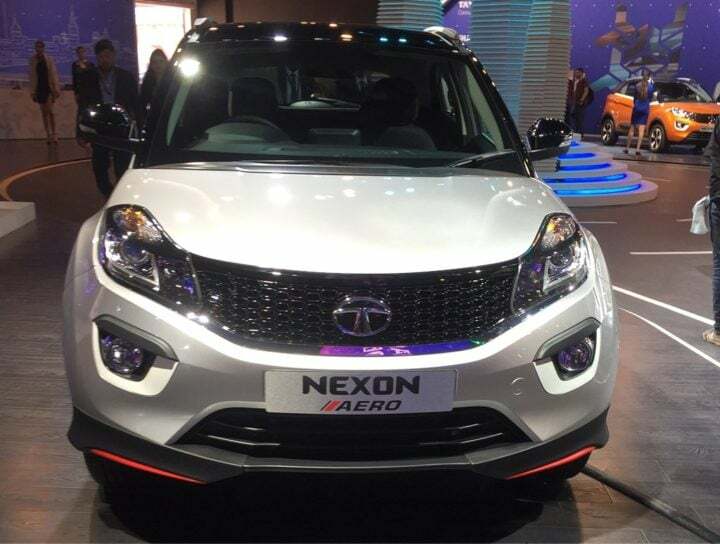 In this report, we tell you all that you need to know about the Tata Nexon Aero kit. Read along to get complete information on the customization packages, prices and more. The Tata Nexon Aero Kit offers its customers five levels of customisation to choose from. The Aero Kit itself offers 3 Levels of customisation with several sub-divided options. The most basic Aero Kit is available to order on XE, XM, XT, XZ AND XZ+ variants. The Aero Kit level 1 offers a body kit with bumper corner protectors and side skirts, Aero badge and front fog lamp garnish. The aforementioned kit is called Aero Kit Level 1 and can be purchased by submitting an additional sum of INR 30,160. The level 2 of the Aero Kit has been divided into 2 sub options namely Aero Kit Level 2 Option 1 and Aero Kit Level 2 Option 2. The former gets red outer rear view mirror covers, Aero seat covers, illuminated scuff plates and Aero and Dicky carpets. The aforementioned Aero Kit Level 2 Option 1 is applicable on the XE, XM and XT grades and can be purchased for INR 40,824. The Aero Kit Level 2 Option 2 features everything in option 1 plus rimbands as well. The Option 2 costs INR 46,856 above the price of the car. The Aero Kit Level 3 is also sub-divided into two levels i.e. Aero Kit Level 3 Option 1 and Aero Kit Level 3 Option 2. The Level 3 Aero Kit is available to order only on three trims i.e. XE, XM and XT. In addition to the accessories offered under Level 2, the Level 3 Aero Kit adds gloss black roof wrap. The same costs INR 55,625. The final and the most costly variant of them all, the Aero Kit Level 3 Option 2 costs a whopping INR 61,574. The final option offers its customer the complete body kit, front fog lamp garnish, Aero badge, Aero and Dicky carpets, red ORVM covers, illuminated scuff plates, Aero seat covers and red rimbands. The Aero Kit Level 3 Option 2 can only be installed on the XZ and XZ+ variants. 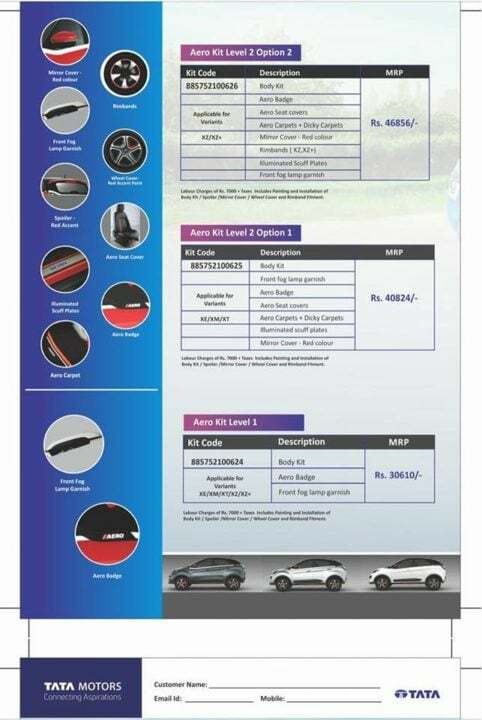 The above-mentioned costs of various kits only include the accessories charge as for the fitment, Tata will charge you labour amount of up to INR 7,000 and if you want to get the gloss black roof wrap, be ready to shell out extra INR 3,500 for installation. All prices mentioned in the article are exclusive of taxes and those are to be paid separately. Stay tuned for more info on upcoming Tata cars.